Any hotel or caterer can vouch for the fact that mass production of freshly brewed, aromatic filter coffee can be a challenge – time consuming, messy and costly. Coffee machines, too, are expensive and demand high maintenance, while every single cup served has to be accounted for in food costs. Caturra Coffee, with an eye on global trends and products, has introduced German-made CAFEA, a freshly roasted and ground liquid coffee, made from 100% Arabica coffee, that it believes is an ideal solution to serving “the perfect cup of filter coffee at the right price”. After manufacturing, the coffee undergoes flash freezing which conserves the aroma. No pre-brewing is needed and no quality or aroma is lost due to heating as in pre-brewed coffee – taste remains consistent irrespective of water temperatures. Slightly concentrated, the strength can be adjusted to suite the needs. CAFEA is additive and colourant free. 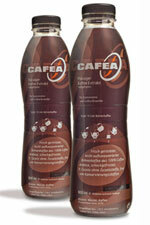 CAFEA comes in 86ml and 600ml bottles and individually packed 5ml “Golden Corners” making one cup. The 86ml bottle can generate up to one litre while the 600ml makes ten litres of fresh and aromatic filter coffee – 80 cups in one second, an average cost price of R1.50 per cup. “CAFEA is very simple, clean and flexible to use, leaving no residues of used coffee grounds. It is hygienic and ultra convenient. Huge amounts of coffee can be prepared in a very short turnaround time. There are limited overheads in staffing, equipment and energy consumption so it is a huge saving for any large event. CAFEA guarantees the perfect cup every time,” says Caturra.